So far, in my exploration of early movies, I haven’t talked at all about early experiments in animation. That ends today, with the addition of the first known film by Winsor McCay, who also wrote the comic strip that “Dream of a Rarebit Fiend” was based on. This movie is based on his best-known and most beloved strip, “Little Nemo in Slumberland,” which was about a boy who dreamt wild and wonderful things each night, and awoke in the last panel of each episode. The movie, however, doesn’t really do much with that theme, and is more about the process of animation. Most of it is live-action sequences in which McCay bets his friends he can make drawing move, collects prodigious amounts of paper and ink, and then toils away at drawing each individual picture. 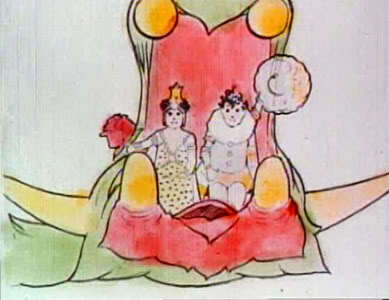 Finally, at the end, we get a brief animated sequence (with some hand-colored sections, in the version I watched) in which characters from “Little Nemo” dance, fight, and interact with each other. A good deal of the screen time is taken up by watching McCay draw his famous characters – sometimes with his hand visible, in a slightly fast-motion live action, and sometimes through “animation” (no hand visible). It’s safe to say that this served mostly as a way for McCay to convince Vitagraph that the technology and interest existed to make this worth pursuing further.